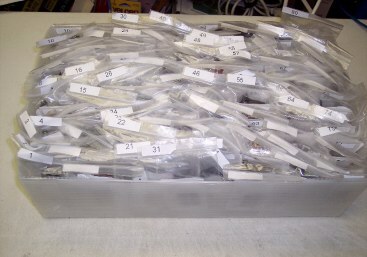 Each box (see below) holds 160 pairs of cataloged glasses. Have 2 trays ($18 ea) and 2 dividers ($60 ea) in stock. Order now before they are gone. Click here for information (not prices) on these boxes. Click here to send an E-Mail to us if you are interested in purchasing some of these boxes. <-- Learn about the adjustable eyeglasses we provide. <- See the Kendall Optometry Ministry information video. Announcing remote training on the use of the Retinomax autorefractor. Click here to see Video #1. Click here to See Video #2. Click to see the details on the new Blu-Ray or 4-DVD set Training DVDs See DVD picture below. Announcing. Glasses Programs now supported on a MAC. Click for more information. 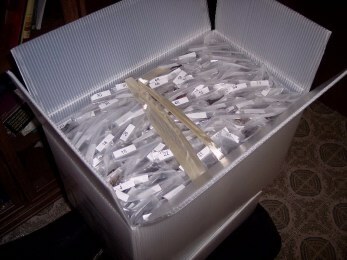 available plastic Eyeglasses Inventory Boxes. Click to see details about the upgraded Glasses Inventory and Glasses Reader programs. Taking orders now for next big order. See the Optometrists Analysis of this prescription. Support us every time you sell on eBay. Click here to know how. 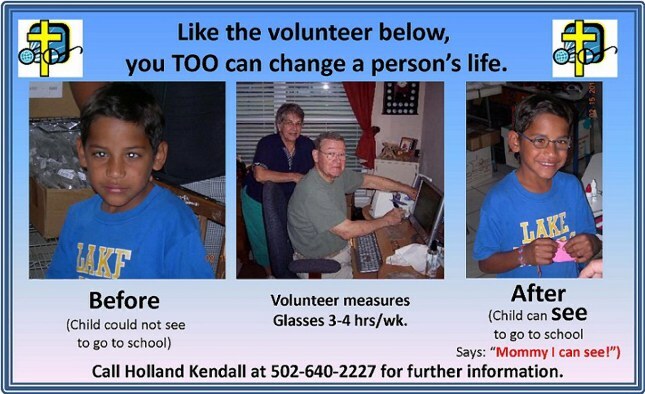 Click here to see volunteer opportunities to help Kendall Optometry Ministry. Click here to see how Kendall Optometry Ministry has grown. Bring them to the Lord. One page brochure showing the sequence of fitting glasses. Pictures are taken from all over the world. 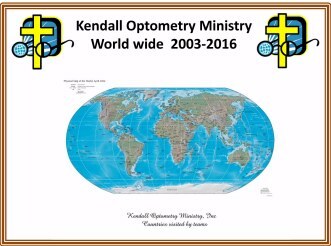 A map of the world showing where teams who use Kendall Optometry Ministry equipment travel. You can zoom into the map for further details. Note: This is a 12MB file updated October, 2010. A presentation give on 6/24/2007 to Parkland Baptist Church in Louisville, Ky about Kendall Optometry Ministry and trying to encourage more particpation in the eyeglasses measurement ministry. I grew up in a Christian family. My father, M. H. Kendall , was a college professor and head of the religion department at Mars Hill College, Mars Hill, N.C. for nearly 40 years. In July, 1999 I decided I would take one mission trip to Honduras working through an organization called "Baptist Medical Dental Mission International" (BMDMI.ORG). My intent was to "pay back the Lord" with this one mission trip. When I arrived in the village, I asked the team leader what he wanted me to do. He said he had several boxes of used prescription glasses to hand out. These glasses were dirty, broken, and not measured. As you can see in Figure 1 to the left (scroll down a bit), we just set them out on a table and people came by and tried them on until something helped them. I immediately knew this was wrong but it was the best we could do then. I came back from that trip with a God Given passion to do it better. Since 1999 I have gone to Honduras 27 times and Nicaragua 3 times. Each time something would be improved. The use of the autorefractor was introduced into Honduras in 2003 (to see Figure 2 scroll down a bit) and another one into Nicaragua in 2004. A special series of computer programs were developed to manage and build the inventory. 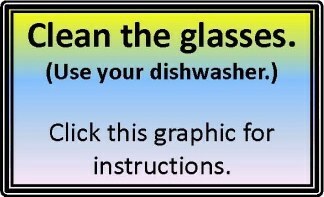 You can review these programs at http://eyeglasses-Inventory.com/. Since 2003 of the 51 BMDMI mission teams more than 95% of these teams use the equipment and software developed by Kendall Optometry Ministry, Inc. In 2003 Kendall Optometry Ministry was incorporated as a 501-3c non-profit company. Using donations provided by several churches and individuals this company purchased a set of equipment which could be loaned out to Christian mission teams going all over the world. Later in 2005 a 2nd kit was purchased and in 2006 a 3rd and a 4th kit was purchased. In the beginning of 2007 a 5th kit was purchased. At the end of 2007 a 6th and 7th kit including a Retinomax 3 was purchased. By the end of 2009 the company owned 10 kits. In 2010 the company purchased two more kits. In 2011 the company purchased 1 more kit bringing the total to 13. By 2017 the company had purchased 18 kits. In 2018 KOM purchased kit number 19. See the growth of the company at this link. 2018 is only part of the year on this graph. Other teams will participate. The teams use this equipment to not only allow people to read their Bible but to also to help them improve their standard of living. You can read about some of these teams in the Teams Supported area of this web site. Eyeglasses Inventory Program now supports the Topcon RK-3000 Autorefractor. The total list supported includes the Retinomax, Retinomax 2, Retinomax 3, Burton Velo 20/10, Canon RK-2 (possibly R-30), Humphrey 597, Topcon KR-3000, Topcon KR-7000, Welch Allyn Suresight, Shin Nippon 8100, Reichert RK600, Marco Nidek ARK 20/30, Marco Nidek Handyref. (12 different models) There is possible support for the Topcon RK-3500, and 7000 series by emulating older models. New features have been added which increase the number of valid matches and record a history of patient measurements. Also the wizard has been enhanced and a new feature called "Practice Play" has been added also with an automatic optometrist analysis of every prescription measured. Glasses Reader Program now supports this list of lensmeters: Reichert Lenschek, AL200, AL500, Humphrey LA340,350, 360, Topcon CL-100/200, Topcon CL-200, Tomey TL-900 & 3000, Nikon NL-2, Shin Nippon SLM-5000, Nidek LM-1000, Marco VL-3000, Justice JS-700, Essilor CLE-060, Seiko SL-7000, VisionX VX40, and Reichert LensChek Plus. (22 different models). Other models of these vendors will likely work if setup to communicate in a compatible fashion. Updates have been made to allow a proper response to a corrupted barcode or malfunctioning barcode reader. Glasses Reader now allows you to print out vacancy number labels to the DYMO printer (included in each of our kits) using the DYMO 30333 Dual labels. It can also flag glasses as Readers to prevent you from putting them into inventory so you can reserve your space for prescription glasses. They are kept with readers and matched to the patient using reading charts which we provide. Both programs now support Windows 2000, XP, VISTA-32, VISTA-64, Windows 7-32, Windows 7-64, Windows 8, Windows 8.1-64, and Windows 10-64. If you own a previous version of this program, you are entitled for an update. Please send a message by clicking this link and request an update.